Federico Poli studied percussion at the Fiesole Music School (Florence, Italy) with J.Faralli, graduated with honors. He also attended courses and clinics with G. Mortensen, N. Rosauro and M. Kershbaum (Wiener Simphoniker). In 1995 he won first prize at the Rovigo National Competition for Young Percussionists (Italy). In 1998 he received a Scholarship at the Fiesole Music School. He also studied with C. Hamouy of (Les Percussion de Strasbourg). He performs frequently as a soloist with orchestras and chamber groups, and he is a member of the music ensemble “Nuovo Contrappunto “. He has also participated in concerts performing the music of the following Contemporary Italian Composers: S.Sciarrino, G.Battistelli, E. Morricone, G. Petrassi, M. d’ Amico, S. Bussotti, I. Fedele, M. Stroppa, F. Vacchi G. Sollima and L. Berio, ecc. 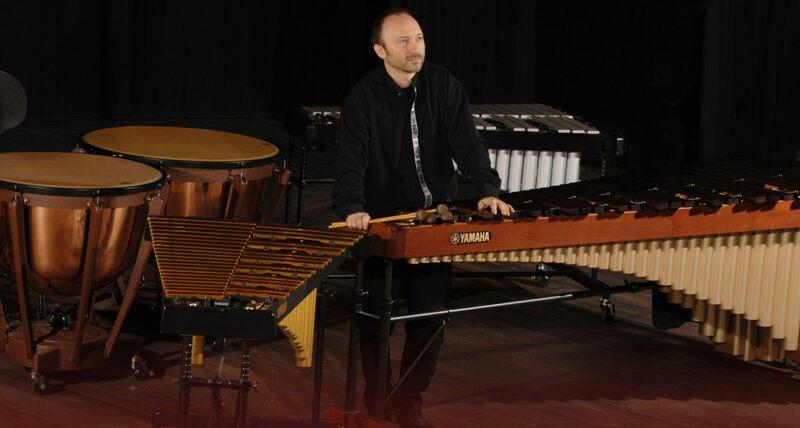 He performs frequently as a soloist, both in solo recitals and with orchestras in various European countries, such as Italy, Spain, Switzerland, and France (Philarmonique de MonteCarlo), and Master Class for Percussions in Italy, Spain. He has commissioned and premiered many new works for percussion, recorded and collaborated with various composers such as E. Morricone, D. Zannoni, K. Khacheh, A. Cavallari, D. Nicolau, F. Festa and M. Betta, A. Portera, M. Curcio, T. Fortmann ecc. who have dedicated some of their works to him. He has recorded TV programs for the Italian State Television (RAI) and operas with the Maggio Musicale Fiorentino Orchestra. He has recorded for the following labels: Velut Luna, EMA records, Brillant classics, AMADEUS, Nuova Era, CMT productions and Dry Castle records. He has recorded 9 CDs for Chamber music and for Orchestra. He has also produced 2 CDs for solo percussion: “Links” and “Percussion Empowerment”. A series of pieces were performed and recorded for the first time and were received with great acclaim from music critics, colleagues and audiences. The 2 CDs are distributed in Italy, Europe and Usa and have had great critic reviews. Federico has also composed and published various pieces for percussion. He is a Yamaha artist and has been present in the YAMAHA concert catalog since 2003. He has been teaching percussions at the R. Franci Superior Musical Institute of Siena (Italy) since 2005.